We’re constantly thinking up new things we want or need to do, adding them to the never-ending list, then moaning about never having time to do them. If you are a writer, you probably complain that so many things get in the way to thwart you that you will never finish your novel. The answer? Don’t have a list! Obviously, it’s good to have goals, but when you have so many that you’ll never have any hope of achieving them, it’s counter-productive. Often you have so much to do, you don’t know where to start. So, the idea is, only put on your list what you can reasonably achieve. In one weekend, no matter how enthusiastic you are at the start, you will not be able to clean out the cupboards, start your novel, read a whole book and go to the movies. Pick one and do it. Then you’ll be happy you achieved your goal, and you won’t be disappointed in yourself for not finishing four other things on the list. Sometimes one day at a time is better than making five-year plans. I’ve got a long-term to-do list that has been the same for about five years. I never cross anything off it, because I never get to it. 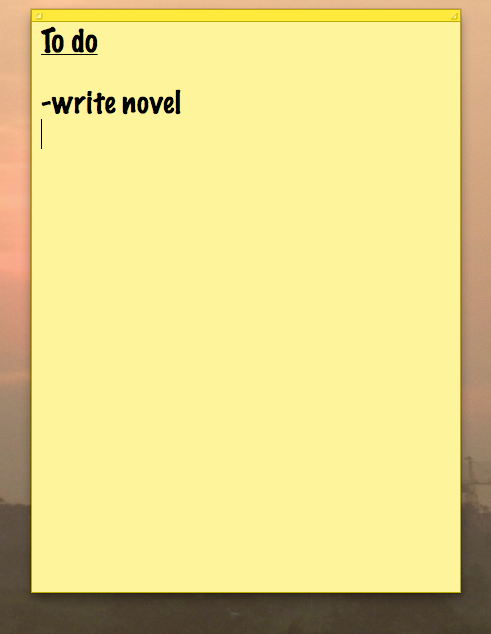 So it’s always lurking there on my virtual computer sticky notes, reminding me what a disappointment I am to myself and others. I’m going to get rid of this list soon. I gave away superfluous clothes from my wardrobe recently. Two big bags full, so now I can find the clothes I wear. The clothes that went to charity were all things I thought I’d wear again. But I haven’t, so out they went, except for a few classics. So now I want to take the same philosophy to my to-do list. I have to realise that I am not going to be able to write 10 more novels in the foreseeable future—and probably not ever. But I think I might be able to write one, and possibly two or three. So I should just pick my top three ideas and forget about the others. I’ve started all three of them anyway. Yes, I know. I should choose one and go for it. Actually, I’ve got a new idea that I think would be great and for which I could happily put all others aside for a year. I’m making a new plan to finish my third book and to have it published. To do that, I will have to put all other things aside, particularly to-do lists, though unless I am successful in attaining a government grant, I won’t be able to give up paid employment. Still, eligible applicants have about a one in 10 chance of getting a grant in my category, so it’s better odds than buying a Lotto ticket. When I was eight or nine, my favourite book was Five on a Treasure Island, the first in the Famous Five series, by the British writer Enid Blyton. It was already an old book, and quite dated, by then, but it captured brilliantly the concept of getting away from adults, of setting up a comfortable camp, and of endless summer days of reading, playing outdoors, and going to sleep under the stars. As adults, we still need to get away from the adult world every once in a while. It’s why J. M. Barrie’s mythical Neverland still appeals to me. In my mind, I have a secret island. I’ve painted it to show you what I see. It’s easily accessible by boat, but for some reason, no one else has discovered it yet. There is a simple wooden house round the back of the island: you can’t see it from this viewpoint, because I don’t want anyone else to know it’s there. All the rooms face the sea, and you can open them all up by folding back the walls. There is a large veranda that runs the length of the house. The house is stocked with the necessary staples, and there is an abundant fruit and vegetable garden and all the seafood you like to catch. There is a deep fresh-water pool nearby with a tiny waterfall. It’s never very hot or very cold on my island. It rains every few days, but just for an hour or so. When the sun comes out strongly in the afternoon, there is a refreshing sea breeze that blows through the house to provide natural airconditioning. Miraculously, there is also fast wireless internet, so I can keep in contact with all my friends on social media whenever I like. At one end of the house, there is an art studio and writing den. This is where I will write my next novel. Well, in my imagination, at least. 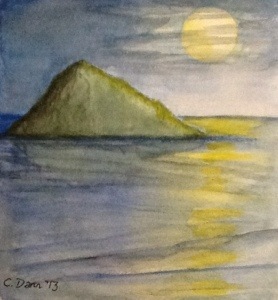 Everyone needs a secret island, even if it exists only on a canvas. This is mine. Let your writing take you into the unknown. 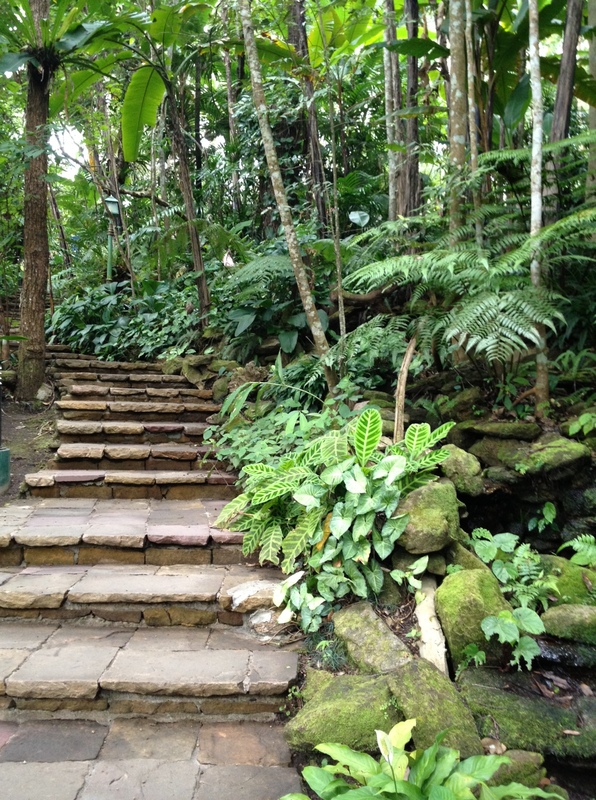 (By the way, I walked along this jungle-like path at Queen Sirikit’s palace grounds on Doi Suthep, near Chiang Mai, Thailand, in November. I didn’t realise until I got home that I had been there before, 20 years ago). I’m not the first to say “Don’t necessarily write about what you know; write about what you don’t know”, but I am still in a minority, as conventional advice tells writers to write what they know and what they know about. This seems strange to me, since writing is a journey of discovery, a journey into the unknown, even if you know your subject matter. There is always something mystical about good fiction writing: it is more than the sum of its parts. More important to creative writing than knowing about your subject or theme is being passionate about them and being able to write about them in a way that no one has written before. However, you do have to do your research. While it’s tempting to jump right into the writing, doing some research before you start is a huge help because it enables you to concentrate more on the writing when the time comes. When I moved to Thailand in the early 1990s, I decided I would write a novel set in 19th-century Siam. I knew almost nothing then about history in that part of the world, except highly romanticised (and mostly incorrect) information from popular western culture. When I found the Siam Society, a club in Bangkok promoting the study of South-East Asian culture and history, I was on my way. They had a library of 20,000 books, many of them on old Siam. I did six months’ research reading these books and taking notes before I started writing The Occidentals. In those days, research was not generally done on a computer screen or using the internet, and we kept track of our research using an index card system, as I wrote about here last week. Actually, writing the first draft of my novel took me only three months—half as long as it took to do the research (though when it was accepted for publication, my editor asked me to add 100 pages, so I had to go back to my research, and I spent another three months on the addition). I wrote every day, six days a week, for five hours, 12.30-5.30pm. The six months’ ground-work had ongoing benefits: I used it as the start of research for my PhD in the 2000s, which in turn became my second book, Imagining Siam: A Travellers’ Literary Guide to Thailand, and which has led to an academic career. In saying don’t be afraid to write about what you don’t know, I’m in good company. For more on writing about the unknown, see this article in The Atlantic by Harvard Creative Writing Faculty director Bret Anthony Johnston. I’d love to hear from you about your launch into the unknown for the sake of your writing. Ye Olde Worlde Filing System, c1991. Remember this? 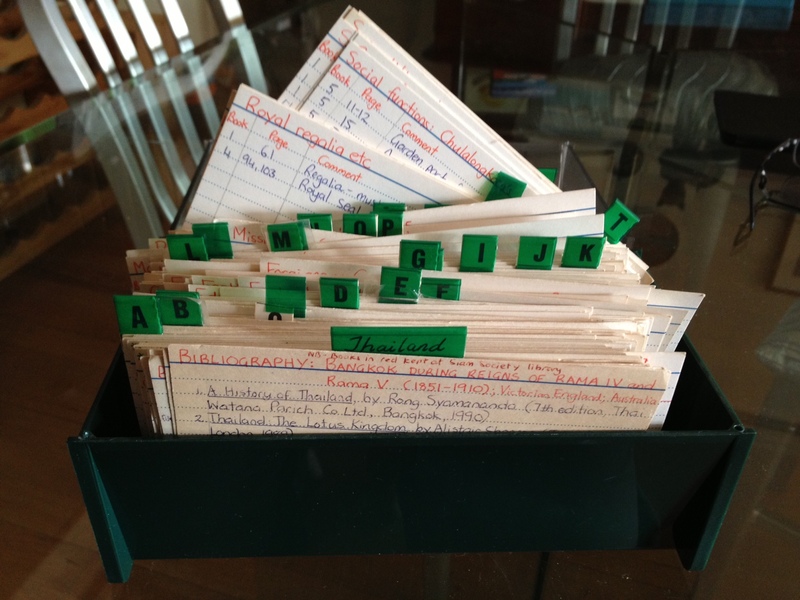 If you’re under 30, you’ve probably never seen one: it’s an index-card filing system. Before the internet, this is how we used to file our research. This is the one I compiled when I was writing my historical novel, The Occidentals, set in 19th-century Thailand. I did six months of full-time research before I started writing the novel. This involved reading and indexing information from 42 books and hundreds of articles. Then, say, when I wanted to know about transport in Bangkok in the 1860s, I would look up the index card labelled “Transport”, and it would tell me the books, articles and page numbers where I would find the information. Though I have not used this index since the late 1990s, I feel sentimental about it and have kept it all this time in my office. I’ve tried to throw it away several times, but something always stops me doing it. However, finally, I’ve agreed with myself, something once so useful has become just a waste of space. So, I thought I would take a photo of it and write an obituary for my dear little filing system. Goodbye, you served me well, but now it’s time to go. Xoxo. This year, I have determined that I will find time to work on my creative writing, instead of just thinking about it. This will mean writing every day, even if I am tired and overworked from my day job. I know I can find the time because of this: nearly two years ago, I took up painting as a hobby. Since then, I have produced more than 40 finished paintings, variously in oils, watercolours, acrylics and pastel. I paint four or five evenings a week, sometimes only for 30 minutes, sometimes intermittently over five hours. Writing after hours is more difficult to do because in my job as an academic, I am on a computer screen much of the day, working on scholarly articles, lectures, and so on, or I am standing in front of a class of up to 60 university students. I don’t feel like writing at the end of the day. I feel like watching TV, eating pasta and painting pictures. So, my best option is probably to get up an hour earlier and write before the rest of the day starts. Or, just make myself write at the end of the day for an hour. Sometimes I don’t feel like painting at first, but if I just set out my equipment and start, I am soon engaged by it. Maybe it will be the same with writing. My other problem is that I have made significant (but slow) progress on two novels, and I think it is better to choose just one to work on. They are both historical novels, and one is a sequel to my first book, The Occidentals, initially published as long ago as 1999, then in German editions in 2003, 2005 and 2007. Where has the time gone? While I’ve done much of the research for these two new books, there is always more to do. Some time, however, I have to stop researching and get writing. I constantly toy with the possibility of writing a contemporary novel, too, and my head spins with ideas. Ideas, however, do not a novel make; constant hard work every day does. Writing a novel is like climbing a mountain: then having to revisit the mountain and climb it all over again when the editing starts. My new writing program starts on Thursday, January 10, because it’s the day after my birthday. Also, my day job doesn’t start until February, so I should have the time I need to get a good start on my projects. I’m looking forward to a fruitful writing year. Have you heard the one about the journalist who wanted to be a novelist? I went to a fiction writing workshop in November at which the tutor, a university lecturer, insisted that “Very few good novels have been written by journalists”. I was astounded by this statement, but said nothing during the seminar, not wanting to be seen as adversarial or—as I am a university lecturer myself—as trying to be a know-it-all and trump the teacher. I was offended, actually, because I am a former journalist and a published novelist, and I think I’m not bad at both. Traditionally, many young people who want to be novelists have been steered into journalism as a way of making a living but still using their writing skills. It seems most journalists I know have a manuscript half-written or ambitions to write a novel. Anyway, this got me thinking about great writers who also worked as journalists. Contrary to what the fiction workshop tutor said, there are many great novelist-journalists. What follows is a list of just a few that occur to me. They are in no particular order and they are eclectic: that is, some are world renowned, others are much lesser known; some are from a previous age and some are current; some are literary, some populist, some both. In a recent article in the Guardian on this topic—specifically on the worth of Will Self’s work—Robert McCrum examines the cliché of the journalist as unable to write good fiction: “What lies behind this prejudice, of course, is the idea that fiction (and poetry) is a higher calling,” McCrum says. “Journalism is hack writing (it doesn’t have to be) and novelists dwell closer to the top of Mount Parnassus (well, occasionally).” Read the full article here. A 2006 scholarly book on the subject, Journalism and the Novel, by Professor Doug Underwood, examines why so many journalists have aspired to fiction writing careers. I think it’s often the other way round: many people aspire to the seemingly more romantic and mystical calling of fiction writing first, then realise they have to make a living as well. That’s what happened to me. I was going to be a famous actor, playwright and novelist. However, making a living as a journalist is not wasted time, for journalism is a fascinating occupation that allows access to people and places that others don’t get, thus providing much material a novelist can use. Just because someone works as a journalist doesn’t mean they can’t write good fiction: that’s faulty logic. Just because I once worked at McDonald’s, for example, doesn’t mean I couldn’t become a chef at a fine-dining restaurant; and just because I worked at Target doesn’t mean I couldn’t become a high-end fashion designer. Making a generalisation, as my erstwhile tutor did, can manifest simply as a prejudice with no evidence to support it. So, my advice to anyone who thinks journalists can’t write impressive fiction is, read The Old Man and the Sea, Animal Farm, Huckleberry Finn, March, and The Quiet American, then get back to me. 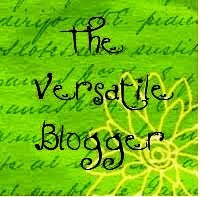 Today’s post is in response to the Weekly Writing Challenge call for bloggers to write about the year that was. With only two weeks of the year left, I checked my personal non-urgent to-do list, written in January, and discovered that I hadn’t done anything on it this year! I was a bit disappointed in myself until I realised that I hadn’t done these things because I didn’t need to. On the other hand, my work-based to-do list is down to one final project, and even that is nearly complete. I like making and working through to-do lists. These days, I use the Stickies app, virtual post-it notes in pink, yellow, blue, green and purple, stuck to the front of my desk-top computer. On my iPad and iPhone, although I have several specialist apps for lists, I use Notes for stuff I have to do right away. It automatically then sends my list to my email. 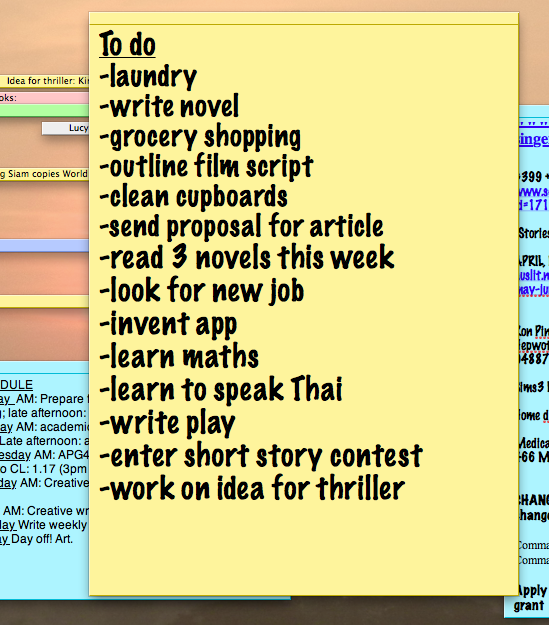 There’s something satisfying about writing a list and then crossing it off as you complete each task. It reminds me of school exams, in which the teacher would write the time in chalk on the board in 15-minute blocks until the finish. She or he would then cross off the time as it passed, so students could see where they were up to. A school friend of mine applied this concept to everyday tasks she didn’t like, such as maths class. At the beginning of the class she would draw up her list: 10.00, 10.15, 10.30, 10.45, 11.00. Then she would cross off each time as it occurred. She said it helped make the class go quicker! My father would have said “Don’t wish your life away”, but back then, we didn’t really understand what he meant. Remember these? My Time Manager folder, 1988-1998. There are even a couple of long-forgotten British stamps, sent to me by a relative because I needed to provide stamped self-addressed envelopes when I submitted work to publishers (no email submission in those days). Apparently, there was something called an international reply coupon, but I could never find out at any post office what this was or where to get it. Unfortunately, I culled a lot of stuff from this folder years ago which would have made interesting reading now. 1. Completed my 10th back-to-back teaching semester as a university lecturer. As a contractor, I don’t get sabbaticals or opportunities to use research grant money to pay others to teach for me, so I have no choice but to teach every semester. I spoke at a conference, chaired sessions at another, and finished or nearly finished writing three academic articles. 2. Spent two weeks in Thailand, including visiting Bangkok for the first time in 11 years. I attended the Reaching the World writers’ summit there and read from some of my work-in-progress at a women writers’ night in Bangkok. 3. Went to the dentist three times. I’m the daughter of a dentist, but my dad died suddenly nearly seven years ago, so it was a big step for me in 2009 to get up the courage to go again regularly, to someone else. After a load of appointments to make things right again, I now have to go only every six months. 4. Got a doctor and plan to have all the tests I should have. I’m a great avoider of doctors, but these things have to be done. I started to change my mind when I read a story about a woman whose friend died of an illness that could have been cured if they’d caught it earlier. “My friend died simply because she didn’t go to the doctor for 15 years,” the friend said. 5. Completed about 15 paintings. My “new” hobby will be two years old in February. A hobby is good for your soul—I urge everyone to take up something they thought they couldn’t do but would love to have a go at. Singing, playing the guitar, painting, running, swimming, whatever. The great thing about a hobby is you don’t need to be great at it and it doesn’t have to bring in any money and you don’t have to do it at a particular time; all you need do is enjoy it. 6. Read more books than last year. 7. Committed to having one day off work a week, most weeks. I have been much more relaxed this year as a result. 8. Cleaned out my wardrobe floor, disposed of unwanted and unworn shoes. Now all the shoes sit neatly in pairs. 9. Arranged a birthday bash for my husband, which was a great success. 10. Started a blog (this one).